Bart and Lisa compete on rival hockey teams. After being told she's in danger of failing gym, Lisa is forced to join an extracurricular team and discovers an aptitude for hockey. Bart's hockey team, the Mighty Pigs, is obviously a reference to The Mighty Ducks, which was arguably at the height of its popularity when this episode was created (it aired a few months after the second film was released). This episode is responsible for another oft-quoted Ralph Wiggum-ism: Me fail English? That's unpossible! Rick, this is why we can't have nice things. You get brought to this very nice and relatively safe place and you just can't be happy. You can't accept it. And you can't accept any trains of thoughts that aren't your own. You haven't always been like this. I mean, yeah, you've generally made bad decisions. But at least most of those decision were for the right reasons. You listened to people. Tried to reason with them. You would try to do the ethical thing. In Australia, the X-Men worry about Wolverine, with Psylocke able to sense his location but unable to read his thoughts. In Tierra Verde, Geist leads a search party through the jungle, ignoring La Bandera and the escaped prisoners to focus on Wolverine. However, Wolverine is suffering from the effects of the tainted cocaine, and though Sister Salvation is able to use her power to help him, the respites are brief. Meanwhile, La Bandera leads her group through the jungle, where they encounter a group of natives. Elsewhere, as Roughouse and Sister Salvation hide from Geist, Wolverine hallucinates that he's in World War II-era Germany fighting Nazis. 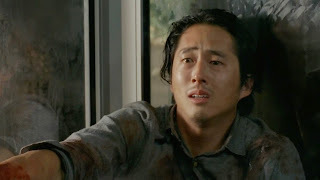 After being injured in the hallucination, he sees Sister Salvation, who tells him only he can save himself. 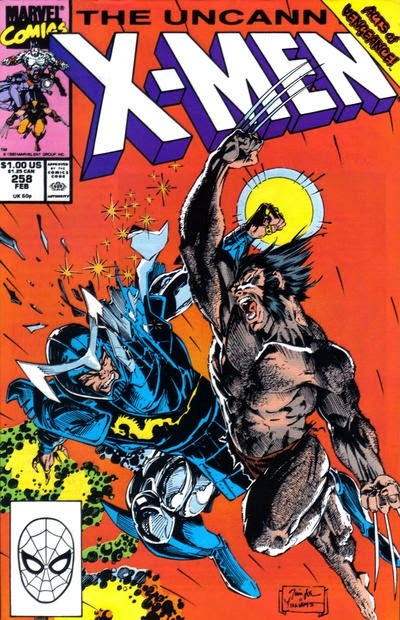 The hallucination continues as Wolverine attacks Geist, who is attending Adolf Hitler, but when he slashes open Geist, a creature called Spore spills out, encompassing Wolverine. Meggan battles Jamie while Kitty ends up back on Earth. Captain Britain attacks Jamie, but Jamie easily overpowers him. Nearby, Widget creates a portal, and when Jamie attacks Shadowcat, she dives through it. Meanwhile, the Dirty Angels arrive at Excalibur's train, while Phoenix, still recovering from Jamie's attack, telepathically awakens Meggan. 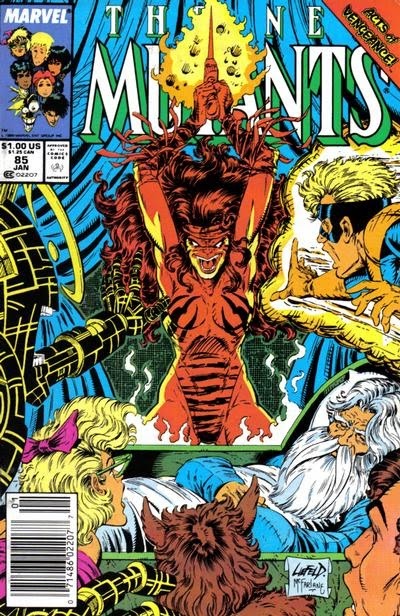 Hoping to surprise Jamie, Phoenix uses her memories of the X-Men and Meggan's metamorphic abilities to enable Meggan to manifest the forms and powers of the X-Men. Elsehwhere, Kitty awakens in a strange bedroom and realizes she's in Jamie's house while Meggan, manifesting Wolverine, stalks Jamie. He sets Captain Britain on Meggan, but she uses Dazzler's powers to knock him out. Back at Jamie's house, Kitty reads through a stack of newspapers and realizes Widget has managed to teleport her to Excalibur's home Earth. Loki is defeated and the Avengers deal with the fallout of "Acts of Vengeance". Captain America #367: Magneto confronts Red Skull at his Washington DC office, chasing him through a series of tunnels, dispatching obstacles along the way. Eventually, Magneto catches and imprisons Red Skull in an underground fallout shelter, leaving him alone in the dark, with nothing but water, to think of the horrors he's perpatrated, to suffer such that he'll wish Magneto had killed him. 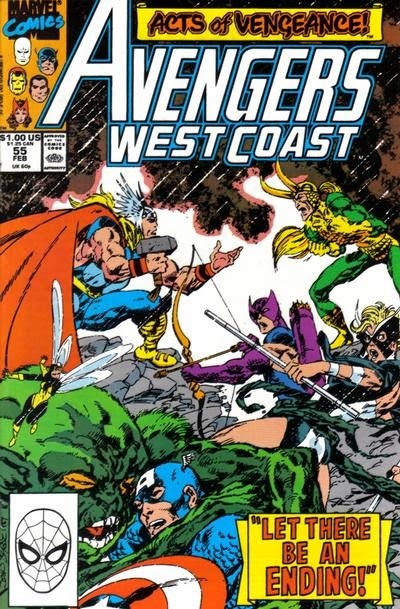 Avengers West Coast #55: Both teams of Avengers meet to discuss Thor's revelation that Loki is the mastermind behind the recent attacks on the Avengers. Meanwhile, in a holding cell, the Wizard activates a teleportation device hidden in his thumbnail and rejoins the Prime Movers. But Loki flies into a rage, saying Thor can trace the teleportation back to this location, and reveals himself to the Movers. Kingpin slips out, but Loki angrily immobilizes Wizard, Red Skull and Mandarin just as Thor appears with the rest of the Avengers. They engage Loki, and during the battle, the rest of the Prime Movers, now ignored, escape. Thor eventually defeats Loki, trapping him in a fissure of his own creation, declaring that the Avengers shall ever and always prevail. April is Cable time*, as Rob Liefeld follows up his New Mutants' debut with the full unveiling of his most iconic creation. Meanwhile, we catch up with a few Siege Perilous-displaced X-Men in Uncanny and the storyline that never ends keeps never ending in Excalibur. 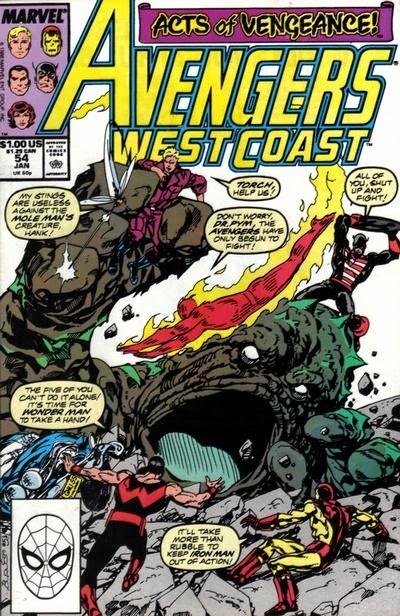 Also, I made a change to the six months-out calendar I posted in January, pushing back Alpha Flight #87-90 (which takes place between Uncanny X-Men #258 and #259 but was published a few months after those issues) and slotting Magneto's Avengers West Coast story (which is, aside from "Acts of Vengeance", pretty much the only overtly villainous story he participates in during this era, and which I'd completely forgotten about when making the original six-months-out list) into its place next month (Avengers West Coast #58 and #59 are a pair of mostly-unrelated fill-in issues; at any rate, Magneto does not appear in them). As always, sound off in the comments with anything I may be missing. *insert your preferred Cable/cable TV pun here. Bart falls for Reverend Lovejoy's daughter Jessica. After a rousing game of Cowboys vs. Indians, the kids are dragged off to church, where Bart encounters the newly-returned-from-boarding-school Jessica. Queen of the Oscars Meryl Streep provides the voice of Jessica, and the actress reportedly recorded her lines in session with Nancy Cartwright, rather than on her own (as many big name stars do when recording voice over work). Obviously, because Streep voiced her, the character hasn't ever made a significant return appearance to date (this episode does make a point of writing her out, ending with Reverend Lovejoy contemplating sending her back to boarding school), though like many other voiced-by-big-star characters, I'm pretty sure she's made some non-speaking appearances since this episode. Well, the walls of Alexandria are beginning to crack. Metaphorically, of course. The literal walls are still OK...for now. The native Alexandrians are struggling to do…anything really. It's really a wonder they've managed to survive this long. But Rick's crew have come in and they're competent. Sure, they can be dicks, but they're competent dicks. X-Factor returns to Earth and settles back in New York. In New York, two surviving Morlocks, Mole and Chicken Wing, are hunted by Sabretooth. Chicken Wing is killed, but Mole uses his power to escape into a building. 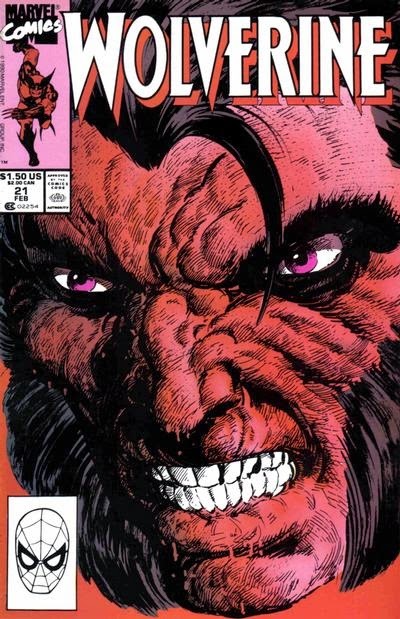 Watching from Apocalypse's base in the Himalayas, Caliban yearns to go to New York and use his new powers to kill Sabretooth, but Apocalypse insists he must have patience. 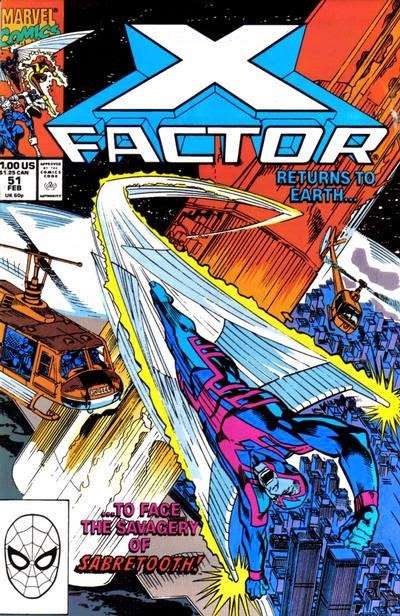 Meanwhile, X-Factor returns to Earth, and Ship lands himself upright where the old X-Factor building was, transforming himself into a skyscraper. Elsewhere, Opal Tanaka discovers Mole in the basement of the record store where she works, but agrees to let him stay. Back at Ship, X-Factor's return has caught the attention of the press and the police, but their helicopters are caught in a scrum and X-Factor springs into action to rescue everyone, including police officer Charlotte Jones. Rusty & Skids battle the Vulture & Nitro. The Vulture arrives at the home of the Tinkerer, angry at the inventor having purloined the Vulture's design for this flying harness, but the Tinkerer explains he was hired to make the wings to enable the Vulture to break out of prison, and to instruct the Vulture to attack Speedball after he escaped. 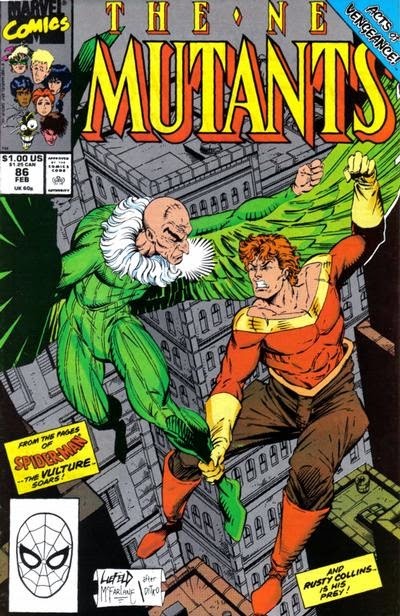 But Vulture scoffs at the notion, instead focusing on his primary goal: freeing Nitro. Back at the prison, Rusty and Skids commandeer a truck, intent on stopping Vulture, despite Skids' reservations about helping humans. Later, Vulture and Tinkerer arrive at the Albany Courthouse where Nitro is being tried, and Vulture swoops in, grabbing the canister containing Nitro. On the roof, Tinkerer works to open the canister while Rusty and Skids arrive below. They climb up onto the roof, with Rusty launching himself at the Vulture just as Nitro is freed. The Hand attempt to brainwash Wolverine. With Wolverine locked in a sensory deprivation tank, Psylocke telepathically enters his mind, attempting to mold him in the image of the Hand. But the process affects some of the Hand guards, and in the ensuing confusion, Jubilee escapes from Matsuo, only to run right into the returning Mandarin. On Muir Isle, Banshee tests Forge's new security system as Lorna attempts to escape from the cell in which Legion has trapped her. 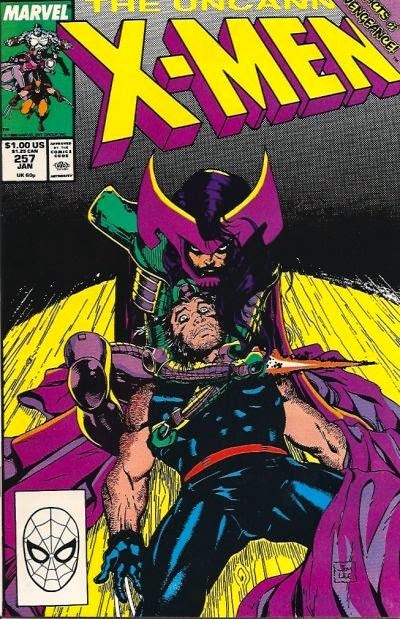 In Hong Kong, Wolverine fights back against Psylocke, forcing her to use her psychic knife to take control of his mind. But doing so causes her to cry out in agony. 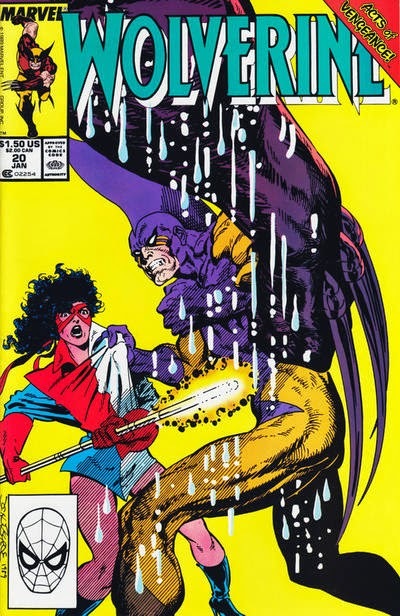 As Wolverine awakens in the tank, Psylocke is somehow attacked by the phantoms of Nick Fury and Carol Danvers, who then turn their guns on the Hand ninjas, leaving Wolverine to face off against Psylocke. 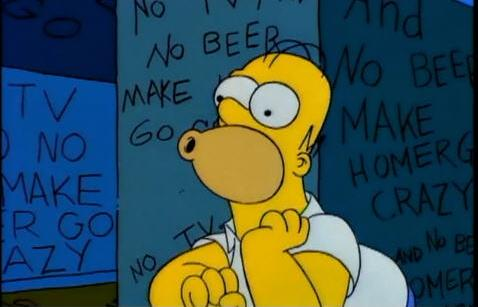 "The Shinning" - No TV and no beer make Homer something something. "Time and Punishment" - Homer mucks up time via a time machine toaster. "Nightmare Cafeteria" - Facing a lack of funds and overcrowded detention halls, Principal Skinner begins cooking the troublemakers and serving them for lunch. Marge addresses the audience warning them about the nature of the episode, saying it is so scary that Congress won't allow it to be broadcast, before Bart and Homer take over the feed to broadcast the episode. This is the first Halloween episode to lack a framing sequence before and after each segment (ie telling scary stories in Bart's treehouse or nightmares triggered by too much candy), though it still contains the "worried Marge warns away the audience" intro, the last such episode to do so. A framing sequence was devised for this episode, but it was ultimately cut to allow each segment more time. While probably a wise choice in the long run, I do miss the framing sequences, as they gave each episode an air of Halloween even if the individual stories weren't always that Halloween-y. Wolverine battles Tiger Shark as he tries to rescue Roughhouse. Tiger Shark drags Wolverine underwater, lodging Wolverine's claws into the coral shelf, trapping him there and leaving him to drown. Meanwhile, La Bandera leads an attack on the Tierra Verde Medical center, but discovers the political prisoners she'd hoped to rescue gone, the whole thing a trap set by Geist. Tiger Shark appears and tries to kill her, but she escapes. Upstairs, Caridad delivers his wife, Sister Salvation, to Roughhouse, who has agreed to use her powers on him in exchange for seeing her son. Below, Tiger Shark hunts for La Bandera, but Wolverine intervenes before he can kill the girl, having fought his way free of the coral. He manages to defeat Tiger Shark but tells La Bandera he needs her help, as he's lost his hearing. 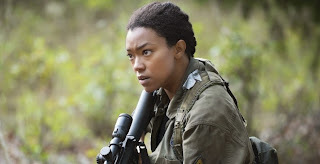 The previous week's episode of The Walking Dead was titled “Remember.” The title of this episode is “Forget.” This is what Rick's group has to do. They need to remember who they were before the zombie apocalypse. They need to forget what they've become after the zombie apocalypse. Life in Alexandria seems pretty sweet (relatively). They have houses, food, beer, running water, electricity, walls and welcoming parties. This is the kind of place you would think Rick's group is looking for. However, Rick's group is having trouble adjusting. Excalibur lands on a world controlled by Jamie Braddock. Guest Inkers: Dan Adkins and co. While traveling between worlds, the mysterious link between Meggan and Phoenix causes Phoenix to violently crash their train onto a new world, one obsessed with a global grand prix of which Captain Britain's brother Jamie is the champion. 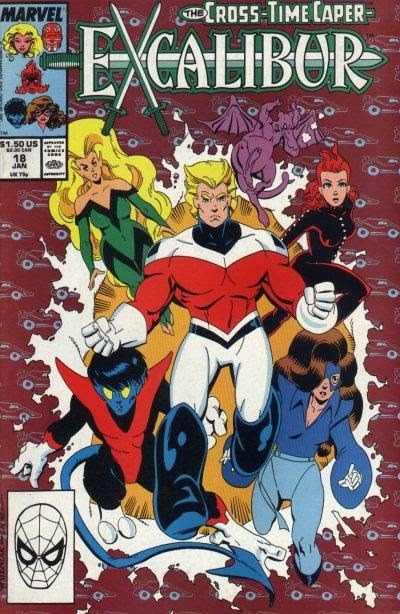 In the wake of the crash, Meggan is captured by Jamie and Captain Britain chases after them, as Phoenix grows sick. Later, Widget transforms into a race car and Kitty, worried about her teammates' continued absence, sets out after them. She comes across Captain Britain, who has lost the ability to fly but is walking after Jamie, and the pair are assisted in their hunt by a two cops calling themselves the Dirty Angels. Sideshow Bob runs for mayor. After calling in to a conservative radio show, a groundswell of public outcry leads to Sideshow Bob being released from prison and set against Mayor Quimby in the mayoral election. This episode contains the first usage of the word "meh" on the show, which has since been added to some dictionaries and become ubiquitous all over the internet. This was also the first episode of the series to feature no chalkboard or couch gag; after the show's title flashes on the screen, we zoom right into the episode, a technique that would be used in greater frequency in later years. Oddly enough, in Lisa's rundown of Sideshow Bob's greatest hits to Homer, she leaves out the time the family had to enter Witness Protection because of him, after which Bob stepped on a ton of rakes and nearly killed Bart on their houseboat. X-Factor helps drive off the Celestials as the Chosen, Rejects and Beginagains unite. The battle rages inside the Chosen arena as Cyclops and his faction of Rejects and Beginagains make their way through the city in search of Christopher and Marvel Girl. After Palik orders the Dualers into the arena to quell the invading Rejects, Lev and Seera rally the Dualers, turning them against the Chosen. Meanwhile, Cyclops reaches the Hall of Science and is reunited with Christopher and Marvel Girl, though Madelyne remains in control of the body. 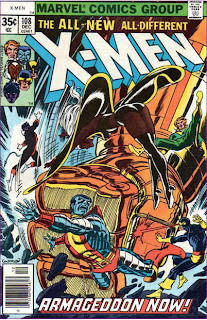 With Cyclops' help, Jean is able to assert herself, but she can feel both Maddy and Phoenix fighting to get free. Together, Cyclops' group knocks out the city's power grid, shutting down the barrier protecting the Chosen from the battle in the arena. As more Celestials arrive outside the city, Palik is forced to restore Archangel's sight, allowing him to overpower Rask. 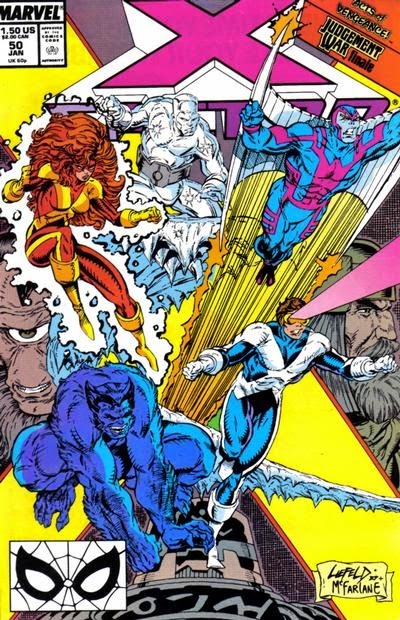 Cyclops and Marvel Girl reach the arena at the same time as Ryest and the Beginagain elders, just as the final Celestial, Arishem lands, outside the city. In last week's post I brought up the quote from Spock in the Star Trek episode "Mirror, Mirror", “It was far easier for you as civilized men to behave like barbarians, than it was for them to behave like civilized men." I think we’re seeing evidence of that in this episode of The Walking Dead. Rick and company have found themselves in a relatively tranquil gated community complete with modern conveniences. It becomes obvious they have no idea what to do with that. When dissecting this episode I suppose the first thing to decide is whether or not you trust Alexandria and their people. I’m taking them at face value. I think they’re a group of people who found a sanctuary that shielded them from the zombie apocalypse. They're genuine (although some are douche bags) but, having been shielded from the zombie apocalypse, they are a bit soft. In other words, I don't think they're perfect but I don't think they're evil. 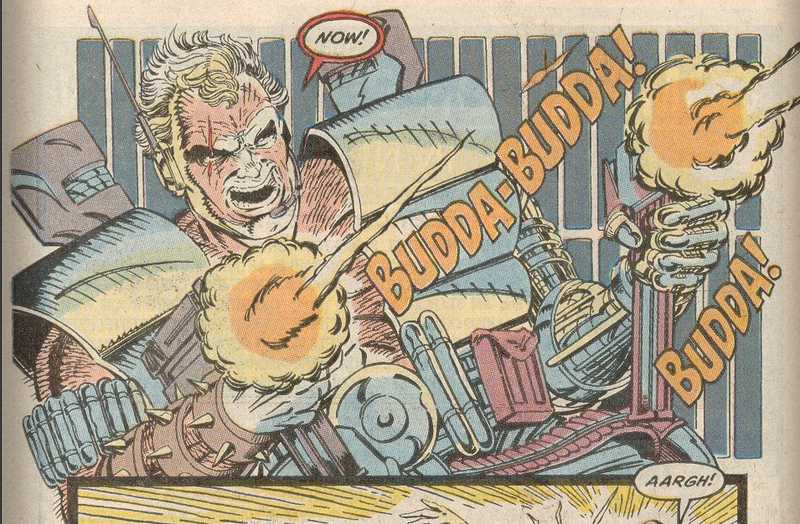 The New Mutants thwart Hela's attack on Odin. Outside the city of Asgard, Hela's forces clash with Asgard's defenders. Spotting Dani heading towards Odin's tower, the New Mutants break off, determined to stop their friend from slaying him. Meanwhile, in Hel, Eitri breaks himself and the Einherjar out of Hela's prison. They enter Hela's portal, arriving outside Asgard. As the Einherjar reinforce the fight against Hela, Eitri heads for the castle, determined to destroy the sword he forged for Hela or die trying. Inside Odin's chambers, Dani prepares to strike the killing blow, but the New Mutants intervene. Dani fights back, burning Rictor and Roberto while knocking out Sam, forcing Rahne to realize Dani is no longer the friend they knew. Just then, Eitri bursts in and manages to strike Dani's sword with his hammer. Psylocke, as Lady Mandarin, uses her newfound martial arts skills and the Mandarin's rings to unite the crime lords of Hong Kong under the Mandarin's control. Meanwhile, Wolverine, disguised as Patch, and Jubilee arrive in the city from Madripoor. In Cairo, Illinois, young Storm flees from Jacob Reisz, who has blamed the death of the doctor her killed on her, setting the local authorities after her. In Hong Kong, Wolverine & Jubilee arrive at the office of Rose, an old friend of Wolverine's. As Wolverine and Rose discuss the situation at hand, Jubilee is taken shopping by Rose's niece Ruth. At the Hand's island base, Psylocke trains and complains to Matsuo of the Mandarin returning to America. The Simpsons visit Itchy & Scratchy Land. After seeing Krusty's commercial for Itchy & Scratchy Land, Bart & Lisa convince their parents to take the family there on vacation instead of the bird sanctuary, promising lots of family togetherness and good memories. This episode was created in response to newer, more stringent censorship laws, which had led to a decrease of Itchy & Scratchy cartoons on the show. 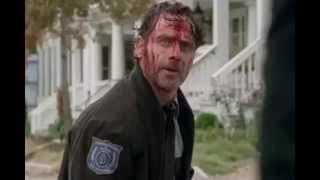 The goal was to craft an episode that was as violent as possible, and showrunner David Mirkin had to fight Fox to keep much of it intact.